Download free the driver for SX445W, direct to Epson Web Site, and install without problem. 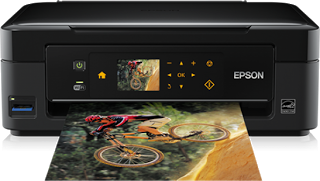 These multifunction SX445W Epson Stylus are printers that allow you to print, scan an copy. You can print about 33 pages per minute in black A4 pages and about 15 color A4 pages, same data is applicable to copies the colors used in the cartridges are black, cyan, magenta and yellow. It scans at about 1,200 ppp x 2,400 ppp. It prints the following types of pages A4, A5, A6, B5, C6 (envelope), DL (envelope), No. 10 (envelope), Letter, Letter legal, 9 x 13 cm, 10 x 15 cm, 13 x 18 cm, 13 x 20 cm, 20 x 25 cm, 100 x 148 mm, 16:9; Customized and it is compatible with the following operative systems Mac OS 10.4+, Mac OS 10.5+, Mac OS 10.6+, Windows 7, Windows 7 x64, Windows Vista, Windows Vista x64, Windows XP, Windows XP x64 among some other functions it has a 6.3 cms LCD screen. The process to install those drivers uses to be a little difficult, however everything depends on the operative system you are using it is always advised to read the post on how to install a driver that is presenting problems. With the above procedure you can learn how to do a good installation of the driver by unzipping them and updating them form the properties option in MY PC. You can download the drivers direct from the Windows page by visiting the following link to download the Windows drivers of the SX445W Epson Stylus printer you can also download the optional drivers for the SX445W Epson Stylus printer as a second option. In case you are not using Windows you can download it from the Epson page by visiting the following link to download it from the page, you have to select you operative system in the top left side, check what system you are using and then download the system driver. You can also download the user manual for the SX445W Epson Stylus printer (pdf).